Purify mouse monoclonal antibodies from serum, ascites or hybridoma cell culture supernatant with this high-yield, mild monoclonal IgG purification kit. The Melon Gel Monoclonal IgG Purification Kit consists of a large package size of Melon Gel Resin and an optimized protocol for easy and mild purification of monoclonal IgG antibodies from hybridoma culture supernatant or ascites fluid. 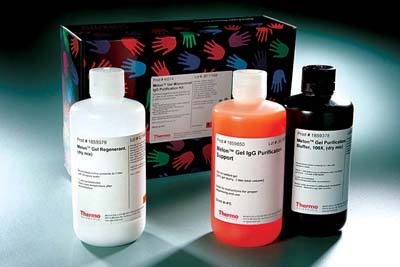 Unlike typical bind-and-elute affinity methods, Melon Gel Purification is based on the binding of non-IgG proteins from a prepared supernatant or ascites sample, thereby allowing the pure IgG to be recovered in the flow-through (non-bound) fraction. Antibodies are recovered ready for use in assays or subsequent conjugation and other modification steps. There is no need to neutralize or desalt to mitigate the effects of harsh elution buffers. Melon Gel Purification saves time compared to classical Protein A or Protein G methods without compromising the quality of the antibody.